Doka UK 25 January 2019.- Artificial intelligence (AI) is more present in our lives than we think, it provides limitless potential and advantages that diffuse through many industries. It has been argued that the construction sector has been one of the fastest to adopt applications, processes and technological implementations in relation to artificial intelligence. In this article we look at analysis of the topic, with findings published by The BBN Times magazine. Let’s take the traditional way of designing a structure. To plan and develop the structure of the building, it is essential that plumbers, welders, electrical engineers, construction engineers, temporary works engineers, safety managers, and mechanical engineers work to develop blueprints and construction drawings. But, it is equally important to ensure that these varying designs from stakeholders align well together. Here’s where construction firms and planners face an issue. Now, with AI, this task can be automated altogether. Once the AI system gathers information on plot details, it learns and tests all possible ways of designing the structure. The AI tool then provides construction managers with the best blueprint and 3D model of the project. The traditional planning and designing process would take a few days or weeks to complete. But, with AI, the entire process is accomplished within a day, thereby saving the firm’s capital and time. Once the construction process starts, the construction manager has to perform tasks such as keeping track of all workers, allotting work, organising the project, and so on. All of these tedious and repetitive jobs can be processed by using AI. Employees input their details, including their job experience, leave, and so on, and AI systems can then accordingly assign the work to employees, taking into account their availability and job experience. It is not possible for construction managers to stay on the construction site all the time, but by utilising autonomous devices like drones,managers can track and monitor the workflows on the job site in real-time. Managers can not only keep an eye on workers and take appropriate action, but incorporate AI models and the companies can also compare photos with the blueprints or 3D design models, to check for any fault. In case the AI system identifies any error, it can automatically send notifications to workers, managers, and engineers, allowing them to take immediate actions. 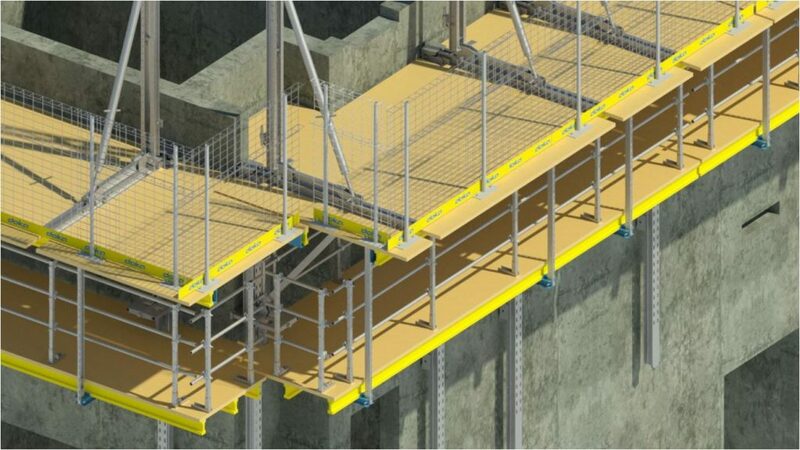 During the construction process, or retrospectively after construction is complete, engineers can embed sensors into the structure, making the building smarter. For example, an AI-powered smart home will automatically learn about heating requirements or the time when people enter a room and decide which lights to switch on, switch off, dim, brighten, etc. and when. The global value of AI in construction market is presumed to increase to around USD 2 billion during the forecast period (2017-2023). The global market is anticipated to register 35% Compound Annual Growth Rate (CAGR) over the same period, owing to the surging demand for safety considerations, asserts Market Research Future. 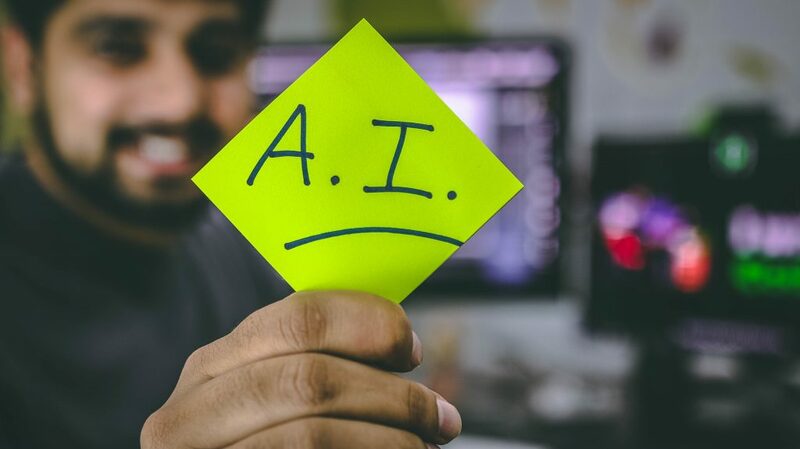 Artificial intelligence is referred to as the concept of machines being able to perform tasks in a way that can mimic complex human intelligence capabilities such as decision making, recognition, and planning. It allows computer systems to make intelligent decisions by applying required skills. Artificial Intelligence is beneficial in the development of applications that incorporate machine vision for tasks such as surveying and easy analysis of structures and buildings. Technological advancements have encouraged organisations, especially in the construction and engineering sector, to gather and share information in real time. This real-time information involves sharing of high volumes of data, which at times is irrelevant, and can increase the capital and operational expenditure of any organisation attempting to evaluate. Thus, to limit the volume of irrelevant data, artificial intelligence plays a critical role in these processes. Artificial intelligence is used to sort and make sense of a plethora of information, which is a pre-requisite for various construction purposes. AI-enabled applications in the construction sector are in a growth stage and expected to become more integrated with building information modelling (BIM) and GPS which would be highly beneficial for project planning, scheduling, and inventory purposes. Moreover, AI is anticipated to support the construction sector in mitigating the existing and repetitive challenges of accuracy margin, project schedule delay, and safety concerns, which are presumed to be one of the major propelling factors for the growth of AI in construction market over the assessment period. 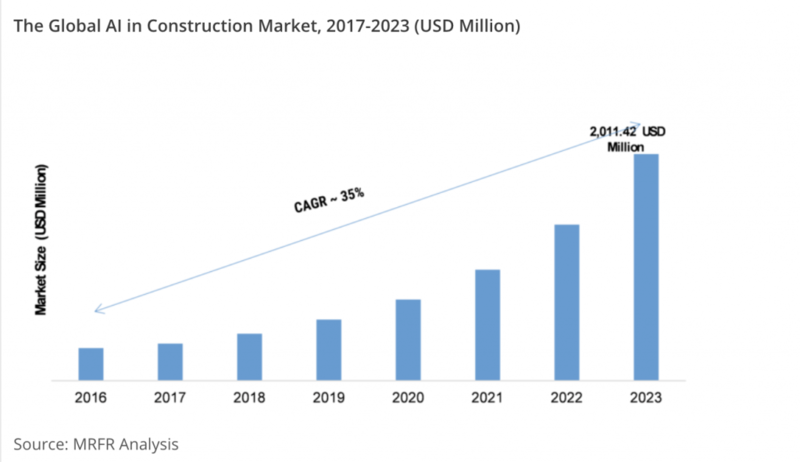 On the flip side, complex algorithms and access to skilled programmers for developing construction specific programs may be an inhibitor to the growth of AI in the construction market over the forecast period.